Saying No To The Inauguration For some Americans, next week's inauguration is a time to protest, not celebrate, the beginning of a second term for President Obama. 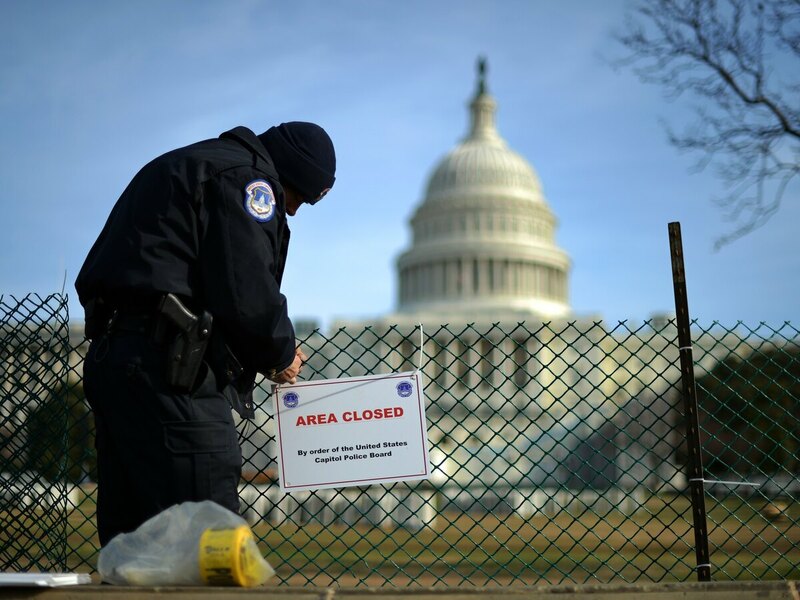 A U.S. Capitol Police officer secures the area surrounding the west front of the Capitol in Washington, D.C., on Jan. 5 as preparations are under way for President Obama's second inauguration. As supporters of President Obama prepare for his toned-down but glammed-up second inauguration over the long weekend of Jan. 19-21, the president's detractors are making other plans. Across the country, disenchanted Americans are engaging in forms of protest — some public, some private — to signal their displeasure with November's election outcome. How do they NOT love Obama? Let us count the ways. In varying degrees, Obama's critics do NOT want the president imposing tighter gun-control laws. They do NOT believe he is a U.S. citizen. They do NOT have faith in his health care plan. Or his fiscal policies. Or his international strategy. Or his Cabinet nominations. They say he is arrogant and unqualified, and he should be impeached, and the list goes on. "I will definitely NOT be celebrating Obama's inauguration," says Yvonne Welz, who lives in Phoenix and is publisher of The Horse's Hoof magazine. "Our American way of life appears to be in danger right now. We are headed full-force toward greater debt, more government control and less individual freedom." Do We Really Need A Second Inauguration? She says, "Every time I think common sense will prevail, something even crazier happens. I am just holding my breath, hoping we can all survive the next four years." Welz is not alone in her criticism of Obama's first term. But she says she keeps her distaste to herself on Inauguration Day. She will not be gathering with others in Phoenix for some sort of anti-inauguration event. "I think that's the big problem for conservative people like me," Welz says. "We're too 'normal' for stuff like that. We don't tend to do extreme things." Obama is calling Jan. 19 "A Day of Service." For many gun lovers, however, it might as well be called "A Day of Service Revolvers." Lawrence A. Hunter, chairman of the pro-guns Revolution PAC, is an organizer of Gun Appreciation Day. The website encourages Americans: "On 01.19.13 go to your local gun store, gun range or gun show with your Constitution, American flags and your 'Hands off my Guns' sign to send a loud and clear message to Congress and President Obama." It is no coincidence that Gun Appreciation Day falls during Obama's inauguration festivities, Hunter says. He and other gun advocates plan "to use the heightened public focus on Washington, D.C., during the week to draw attention to the event." After all, says Hunter — a White House policy adviser under Ronald Reagan — the inauguration "is a pivot point, and certainly we all understand that the minute Obama takes the oath of office, he will be off and running in a second term, and he, better than anyone else, recognizes the fact that a second-term president very soon becomes a lame duck. So, if he wants to accomplish something big and controversial, it has to happen quickly." The daylong event is sponsored by more than 90 organizations, including the Second Amendment Firearms Emporium in Brunswick, Ga.; Trigger Happy Guns and Ammo of Belpre, Ohio, and Ole Boy Outdoors shooting range in Bakersfield, Calif.
Take a look around the country, and you will find other dissenters planning to protest. Various sites, such as the Tea Party Tribune and Free Republic, are promoting a "Massive Anti-Obama Rally on Obama's Inauguration Day." The notion, according to the announcement, is to have scads of anti-Obama activists gather on the National Mall on the morning of the public swearing-in. There are anti-Obama Facebook pages. And anti-Obama websites maintained by outspoken detractors that hope to stop the inauguration or set into motion the wheels of impeachment. And then there are folks like Cathy Bilsky, owner of the Crystals, Miracles & Joy shop in Honokaa, Hawaii. Bilsky does not think Obama should have signed the National Defense Authorization Act, which allows the government to keep suspected terrorists in custody indefinitely. "Indefinite detention is not the sign of a good president," Bilsky says, "but a man who wants to be a king." She is not a believer in Obamacare, "which is making me buy health care insurance that will not cover my alternative methods." On Monday, she hopes to meet up with some other anti-inauguration people in Hilo. But if that doesn't work out, she says she will definitely post a sign in the front window of her shop that says: "The only hope we have is to pray for some enlightenment to descend around Obama."